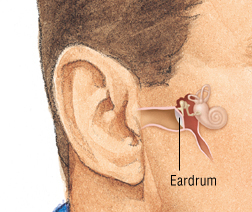 The eardrum is a thin membrane that separates your ear canal (the part that is open to the outside) from your middle ear. The eardrum, also called the tympanic membrane, is involved in hearing. Sound waves cause your eardrum to vibrate. This begins the process of converting the sound waves into an impulse that travels to your brain, where it is recognized as sound.